Hugely popularised by companies like Apple, the Net Promoter Score (NPS) has become adopted as an industry standard metric for benchmarking a company’s performance. It aims to measure customer sentiment towards a company and can be used as a leading indicator of growth. It’s well-established that word of mouth recommendations, coming from people you trust, are still the most valuable form of marketing. Customers from referrals are both more profitable and more loyal. It makes sense right? We trust our friends and colleagues to give us good advice and we want to act on it. The answer is on a scale of 0 – 10 where 10 is ‘extremely likely’. Think about it, why would a customer actually recommend you….? Maybe none of the above? Leaving this answer deliberately open ended means you can stop guessing which tick-box categories you think you might be good/bad at and lets the customer tell you what they really think. A customer who is actively promoting you is also actively growing your business. Inversely, somebody who wouldn’t recommend you is both likely to churn themselves and tell people about their bad experience, thus fuelling negative growth. Customers who are satisfied but not necessarily loyal. Customer who genuinely love your product. Total up how many of each type you have, then your NPS score is simply the percentage of promoters taken away from the percentage of detractors. This implies you could have a score anywhere between -100 and +100. Although the qualitative feedback is often more interesting than a seemingly arbitrary score, the score is important so that you can plot sentiment trends over time. Also whatever scale you provide for people to score you on, NPS or otherwise, you can safely assume that any people who give you top marks feel strongly about liking you. We all know how tedious filling in customer satisfaction surveys can be. If you want somebody to respond, keep it short and simple. An NPS survey should never be longer than the 2 core questions. Keep the email clean and direct – less is more. Don’t clutter it with marketing and definitely don’t try and skew your results by offering incentives to reply. We decided to include a short sentence to provide some context around the survey. It could also be an opportunity to reassure the customer that every response is read, reinforcing the idea that their feedback is genuinely important and of interest to your company. The email subject line should also be short and personable, it’s both easy to read and less likely to get truncated on mobile. To draw meaningful conclusions any survey needs a decent sample size. It’s hard to predict how many people will respond but most estimates tell you to expect ~20% response rate. We didn’t take any chances with the numbers and decided to survey every single paying customer. If you’re truly interested in how your brand is perceived, it’s best to avoid tying NPS to any particular action. The experts at Promoter insist that in-app NPS is a bad idea. Popups are annoying and the sentiment a customer feels at that particular point in time is most likely tied to their current in app action, not to your brand overall. Do you want to survey at the point of purchase or maybe a month after? How do you stop sending surveys to a customer when they cancel? – spamming ex-customers will only annoy them. How do you make sure you’re not sending a survey that will get lost amongst 5 other transactional emails they just received for signing up and making a purchase? The more data you have on your customers the easier these decisions become and the easier it is to be smart with automation. Internally we use our own app, People CRM, to define the type of customer that we want to survey, and a time window for when we want the survey to be sent. Our Smart Groups feature allows you to combine as many filters as you like to group users with similar attributes. When a customer matches the filters, they automatically get added to the group, which triggers a Zap to push them to Promoter.io and they get sent a survey. Simple. Don’t send all your surveys at once, otherwise you will only get a small snapshot of customer sentiment during that time window. Instead send surveys on a rolling basis for each of your customers (e.g. 30 days after they purchased), so that every day you get a constant stream of feedback and don’t get bombarded all at once. This also makes following up with your responders much more manageable. Any customer that takes the time to respond deserves a proper response. If nothing else, just to say thanks for taking the time to reply, but it’s also a great opportunity to start gathering more targeted feedback. An NPS response is the start of the conversation, not the end. The most obvious follow-up is to ask them to clarify the reasons for their score. 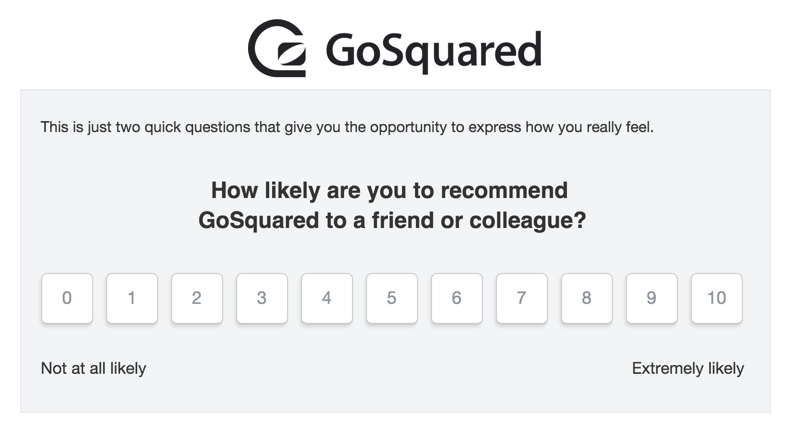 What is your #1 problem that GoSquared isn’t solving right now? It’s important to tailor your follow up depending on the NPS type. Promoters are by far the easiest people to get back to. Understanding what delights your customers is just as important as learning where you need to improve. So again if a promoter didn’t initially leave a comment, ask them for clarification. A great way to keep a promoter is to over-deliver, say thanks by offering them a freebie. A free t-shirt is a nice surprise and a great way to encourage engagement. It gives them a reason to reply to confirm they want one with the added bonus that by wearing your t-shirt the customer has literally become a promoter of your brand. Encourage promoters who have left a comment to share the love. Make this easy by providing some action for them to take, give them a link to Tweet you. Ask them to leave a review somewhere public like G2 Crowd or perhaps just ask them for a quote for your marketing site. Maybe you value their technical feedback, then ask them to become a beta tester. We find we get the best response when we only ask a customer to do one thing. Generally speaking a passive is already fairly satisfied customer. However, you could be doing much more to turn them into a loyal customer. In most cases you just need to maximise the value they’re getting from your product to give them more reasons to stick around. Perhaps they’re only making use of half of the available features. Perhaps there is some low hanging fruit you could implement that would make their life much easier. Perhaps they’re on the wrong pricing plan and would benefit from an annual plan discount. You don’t need to hard sell to passives because they’re already paying. It’s just about doing the small extras that re-engage and remind them of why they signed up in the first place. When my Macbook screen inexplicably failed, my lasting memory is not that Apple’s build quality had let me down. The story I always tell is how impressed I was that they replaced it the same afternoon, completely free of charge. The trick is that even if something does go horribly wrong, the take away for the customer should always be how good the solution to the problem was, not the fact that a problem arose in the first place. The first step is to make sure that each customer gets a sincere and personalised response. Not only does this re-enforce the point that you actually listen and care, but it’s also an opportunity to win them over by offering more value from the product. Coach them through a feature they’re struggling with, prioritise feature requests and file proper bug reports. Following up with them when they’re patched/implemented is a great way to delight people. Be transparent when things go wrong, customers are much more likely to be understanding when they’re kept in the loop. Make your status page easy to find, manage expectations to avoid disappointments and be honest about your own limitations. There’s nothing worse then a customer who harbours resentment towards you for over selling and coming up short. Realistically you can’t win over every detractor and some degree of churn is inevitable, however when somebody does eventually churn, make sure they always leave on a high. Putting NPS in context requires you to combine NPS with all of your other user information. People CRM makes it obvious how you should be directing resources. Trends emerge, perhaps all your promoters share common attributes. Are they from the same country, sector, company size etc? You can easily discover exactly which demographic you resonate with and who your ideal customer is. Notify your support team to engage with a detractor before they churn. Instantly notify your sales teams to target new customers who fit a promoter profile. Get your dev team to prioritise feature requests from your biggest fans. Start taking smarter action today with a free GoSquared trial.